Welcome to the website of the FEBS Advanced Course: “Functional imaging of (nuclear) organisation and signaling”. Every year the van Leeuwenhoek Centre for Advanced Microscopy (LCAM) is organising a microspectroscopy course for young scientists, PhD students and postdocs, entitled “In the footsteps of van Leeuwenhoek”. 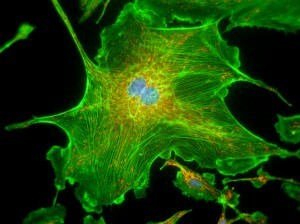 This years course topic is focused on cellular signaling and is financed by FEBS. The ability of cells to perceive and correctly respond to their environment is the basis of development, tissue repair, and immunity as well as normal tissue homeostasis. Errors in cell signaling are responsible for many diseases such as cancer, autoimmunity, and diabetes. The nucleus plays a central role in these processes because in this organelle the genetic blueprint of the cell is located and highly dynamic processes like gene activation, transcription and chromosome duplication are taking place. By increasing the understanding of the complex nuclear organisation and signaling, related diseases can be treated more effectively. Microscopic techniques allow to visualize nuclear organisation and elucidate signaling complexes and their dynamics in time. Because of the recent technological revolution in advanced light microscopy (i.e. functional imaging of molecules, development of caged compounds and biosensors) it is now possible to directly monitor the dynamics of (single) molecules in living cells. Several new microscopy techniques are available but their application remains limited because most biologists have never been introduced to these technologies. This practical advanced course will be organized to provide students the theoretical background and give hands-on experience of state-of-the-art microscopy techniques. Although application lectures will be focused at nuclear signaling the discussed techniques can be used to study cellular signaling in general.